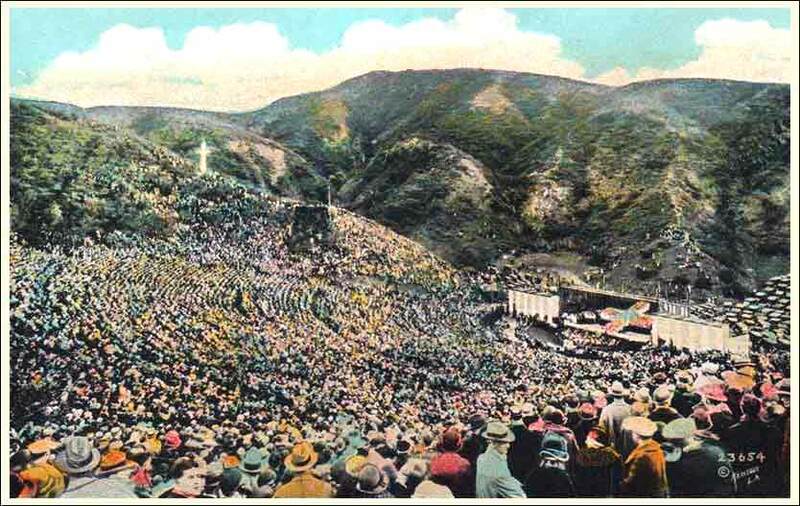 1920s postcard of an Easter Sunrise Service at the Hollywood Bowl. The importance of celebrating Christian holidays as a community is the subject of today’s Scripture. All through this day, O Lord, by the power of your quickening Spirit, let me touch the lives of others for good, whether through the word I speak, the prayer I speak, or the life I live. If you obey God with your whole heart, you’ll usually scare off the folks who want you to obey them. Three times in the year shall all your males appear before the Lord God, the God of Israel. For I will cast out nations before you and enlarge your borders; no one shall covet your land, when you go up to appear before the Lord your God three times in the year. Today's quote requires all the males to gather three times a year for celebration. We get a good glimpse of how these laws were carried out because of the Gospels, when Jesus goes to Jerusalem for Passover. Women and children would make the trip if they were able, although they could be excused; but it was mandatory on men of full age, about 20, and considered very nearly mandatory for older boys. They would form up as a caravan for protection and company, and in modern terminology, have a party. In many cases (as with Joseph's family, which lived in Galilee) it was a journey of several days. The most striking characteristic of the three enumerated celebrations is that they were community celebrations. A town or village traveled as a group, and everyone in Israel was expected to attend, either in person or by the proxy of male family members. We have come to see our Christian celebrations more and more as family affairs; and indeed, in many cases, it is difficult enough to get family members together. But there is no mistaking that the spirit of this law — which is as much one of the "ten commandments" as "thou shalt not steal" — requires the faithful to gather as a community of believers, not as a cohort of blood relatives or friends. We can see this reflected clearly in the habits of devout Christian communities throughout history. The Puritans — picture an early Pilgrim Thanksgiving, and you picture the entire community gathered together. If you study the Amish today (whose "family values" are among the strongest in the world), their celebrations are markedly celebrations, not of families, but of their church community. Living as a Christian in our increasingly secular society, where aggressive atheism is markedly on the rise, there is a corresponding tendency for Christians to become isolated. It is in fact quite difficult, for many people, not to become isolated. But those of us who face this hurdle must resist it. For the meaning of one of the "ten" commandments is quite clearly: "Thou shalt gather together with others who fear God to worship and celebrate, for a major festival, three times per year." If this sounds moralistic or proscriptive, it is not; it is a commandment given to us because of how much God loves us. It is a commandment created to ease our burdens, to lead us to happier, more productive, more joyous lives, and to help us walk closer to God. 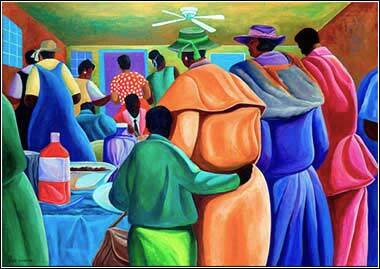 Church Dinner by Ivey Hayes, ca. 2002.